5 editions of Dio's Roman history, with an English translation by Earnest ... found in the catalog. Add another edition? Are you sure you want to remove Dio's Roman history, with an English translation by Earnest Cary, PH.D., on the basis of the version of Herbert Baldwin Foster, PH.D. from your list? 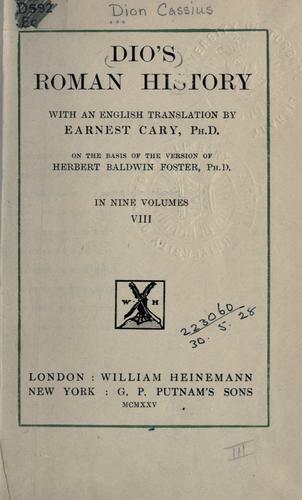 Dio's Roman history, with an English translation by Earnest Cary, PH.D., on the basis of the version of Herbert Baldwin Foster, PH.D. 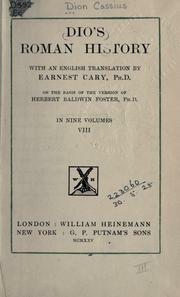 Published 1925 by W. Heinemann in London, New York, USA . More by Cassius Dio Cocceianus. July 10, 2015 Edited by Alex Herrera added TOC, edito and translator names, pagination etc.